Large, beautiful seven-tube radio with three bands (AM and two SW), with a multi-colored tuning dial that's sure to amaze. Nice bright, sensitive green magic tuning eye, which have always mesmerized me since childhood. 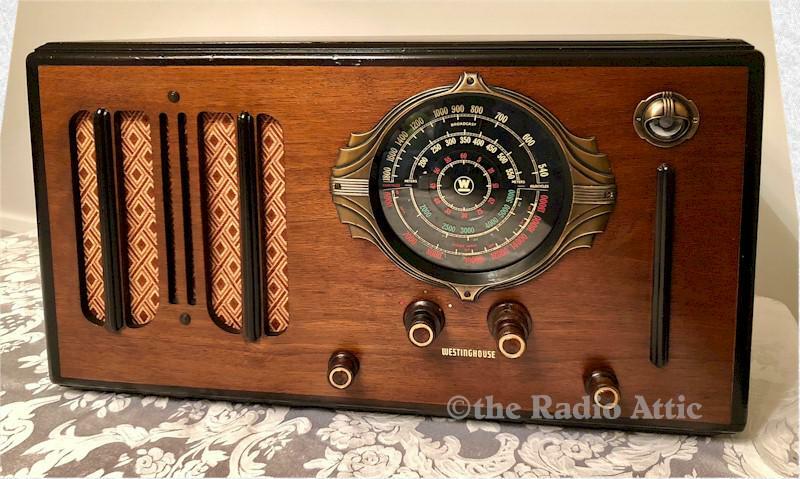 Who would expect Westinghouse to produce such a lovely radio? It is a heavy, well-constructed cabinet, not often found in radios of this era. This model does Not come up often and in my 30 plus years of collecting radios, this is only the 2nd one I have ever seen. The cabinet was refinished several years ago, using the very finest toning and finishing lacquers, producing a nice luster. The electronics have been completely restored (no shortcut repairs, is internally fused and has a new polarized power cord for your safety), and it plays very nicely on the AM broadcast band and both shortwave bands, and the tone control enables you to adjust the audio the way you prefer. I have added an MP3 input so that you can listen to whatever style of your own supplied music you prefer. Be mindful this radio weight in at a bit over 30 pounds, which will affect shipping costs to your location. 23"W x 12-1/2"H x 10-1/2"D.